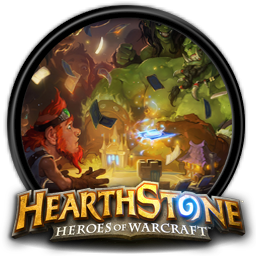 Hearthstone is a turn-based strategy card game with the Warcraft universe as its theme. There's nine heroes to choose from and each of them have class-based cards and hero abilities to use. It's open beta and free, and there isn't a lot more to it than just try it to find out if you enjoy it or not. You can create a deck containing 30 cards. Each card are unique form each other. There are many different cards you can obtain but you only start with some basic cards. Some cards are class-based. A card can cost from 0-10 mana to play. shows how much mana the card cost to play. You gain 1 new mana crystal each turn. Minions are like troops. They cannot do anything the turn they are played and you'll have to wait until it is your turn again before you can attack with them. The minions can have a wide variety of attributes as well as descriptions. The Bluegill Warrior is a minion. All minions has to wait a turn before attacking by default. However this is not the case with the the Bluegill Warrior. Notice that minion has a description where it says Charge - This allows the minion to attack the turn you play it instead of having to wait a turn. The Bluegill Warrior costs 2 mana to play, and has 2 attack and 1 health. It is also considered a Murloc which is also a feature of the minion and can become very relevant for synergy-based decks. Some murlocs can have the description 'Give all other murlocs +1 attack', which would turn our 2/1 minion into a 3/1. Spells can have a wide variety of descriptions and effects. Frostbolt is a Mage spell. Description: "Deal 3 damage to a character and Freeze it." - This means that you can cast it on either a minion or a hero, and then freeze the victim for 1 turn. If you cast it on an enemy minion, that minion will take 3 damage and are unable to do anything next time it is the enemy's turn. This is especially efficient when you want to 'stall' taking damage and hope for better luck drawing a card next turn that can wipe out that minion. 2019 © Aprilon — All times are UTC + 1 hour. The time is 17:12.